Large Farmhouse 7km from Hesdin, centre of a village, large farmhouse in need of some internal updating, set on 1673sqm of land. It comprises of: large lounge/dining room of 50sqm with 2 log fireplaces, fitted kitchen of 35sqm, 4 large bedrooms downstairs, bathroom, wc, garage, vaulted cellar, loft to convert, double glazing windows, mains drainage. Good potential. Fully fitted kitchen of 12m², living room of 30m². 3 bedrooms of 12m² 11m² and 10m². Shower room and WC separate. Basement comprising a kitchen, garage, workshop and WC. This house / villa (contemporary house) , with a land size of 613 m² (about 0,15 acres) contains 11 rooms including 4 bedrooms, 1 bathroom and 2 toilets. It is equipped with a living room, with a garage and with a cellar. Heating : gaz. Spacious bungalow with loft to be converted. ON GF: Kitchen of 17 m², living / dining room of 35 m² with fireplace,3 bedrooms of 13 m², 14 m² and 12 m²,shower room comprising shower and washbasin,separate WC. Attic to be converted of 50 m². Situé au coeur du bourg, maison ancienne entièrement rénovée. RDC : Cuisine de 23m² aménagée et équipée, salon de 20m² équipé d\'une cheminée. Buanderie/chaufferie de 6 m², WC indépendant. Petite courette fermée. douche, vasque sur meuble et WC. Autre chambre de 11m². 2em Etage : Chambre de 17m², autre chambre de 20m² avec, salle d\'eau privative, (douche, lavabo et WC). Renovated Stone Cottage. La Haye Du Puits area. 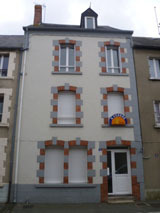 Nice house situated in the countryside and only 3,5 kms drive to the town of La Haye du Puits. 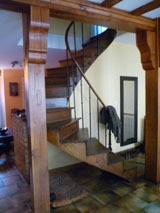 On GF: Entrance hall, Kitchen of 15 m², Lounge of 22 m² with fireplace and wood burning stove, Laundry of 11 m². Shower room comprising shower and washbasin, separate toilet. On 1st floor: Landing / study, 3 Bedrooms of 14 m², 15 m² and 20 m². Electric heating. Septic tank. Garden of 765 m². ON GF :Entrance hall, Living / dining room of 20 m² with fireplace and wood burning stove, fully fitted kitchen of 8 m², shower room comprising shower, washbasin and WC, utility room of 17 m². Attached to the main house, part to be converted comprising : room of 20 m² with fireplace, other room of 10 m² with staircase. Modern House with bedroom on GF. Courtyard and garden of 1153 m². ON 1ST FLOOR : 2 bedrooms of 7 m² each and study of 7 m². Land of 1 acre with outbuildings. On 1st floor : 3 bedrooms : of 20 m² (mezzanine), of 12 m² with ensuite WC and washbasin, and of 9 m². Lovely private garden of about 2000 m² and the rest of the surface is a field. In a quiet environment , this house / villa , with a land size of 4400 m² (about 1,09 acres) has 4 rooms including 3 bedrooms and 1 toilet. It has a living room. In a quiet environment , this house / villa , with a land size of 361 m² (about 0,09 acres) comprises 5 rooms including 3 bedrooms, 1 bathroom and 1 toilet. In a quiet environment , this house / villa (contemporary house) , with a land size of 750 m² (about 0,19 acres) comprises 7 rooms including 3 bedrooms and 1 toilet. It is provided with a living room, with a terrace and with a garage.